ShuffleExchangeExec is a Exchange unary physical operator to perform a shuffle. 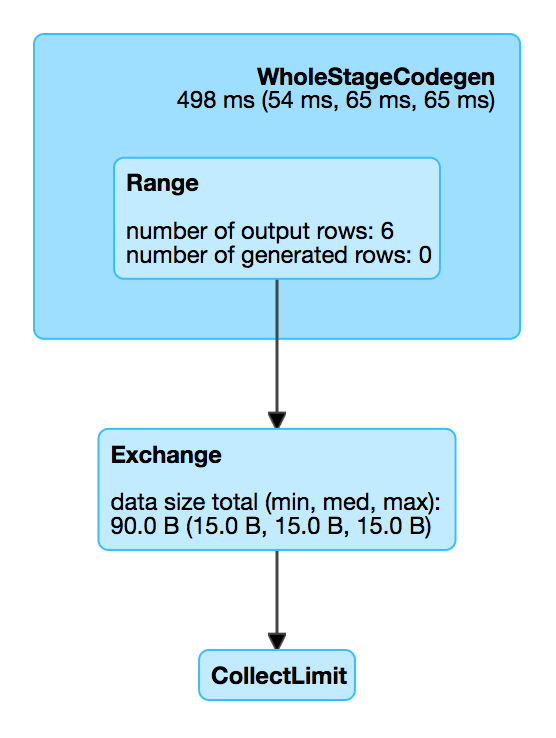 ShuffleExchangeExec corresponds to Repartition (with shuffle enabled) and RepartitionByExpression logical operators (as resolved in BasicOperators execution planning strategy). ShuffleExchangeExec shows as Exchange in physical plans. When created, ShuffleExchangeExec takes a Partitioning, a single child physical operator and an optional ExchangeCoordinator. nodeName is computed based on the optional ExchangeCoordinator with Exchange prefix and possibly (coordinator id: [coordinator-hash-code]). outputPartitioning is the input Partitioning. While preparing execution (using doPrepare), ShuffleExchangeExec registers itself with the ExchangeCoordinator if available. When doExecute, ShuffleExchangeExec computes a ShuffledRowRDD and caches it (to reuse avoiding possibly expensive executions). ShuffledRowRDD that is cached after ShuffleExchangeExec has been executed. doExecute creates a new ShuffledRowRDD or takes cached one. doExecute branches off per optional ExchangeCoordinator. If ExchangeCoordinator was specified, doExecute requests ExchangeCoordinator for a ShuffledRowRDD. Otherwise (with no ExchangeCoordinator specified), doExecute prepareShuffleDependency and preparePostShuffleRDD. In the end, doExecute saves the result ShuffledRowRDD for later use. prepareShuffleDependency creates a ShuffleDependency dependency. prepareShuffleDependency is used when ShuffleExchangeExec prepares a ShuffleDependency (as part of…​FIXME), CollectLimitExec and TakeOrderedAndProjectExec physical operators are executed.